Hello, Friday! This has felt like the week that never ends, and I am thrilled that the weekend is finally here! This heat wave has zapped me of any energy, so I'm going to keep the chit chat short and jump in on today's blog post while my brain is still working. Today's post features another beauty product I discovered while attending Cosmoprof North America this summer. 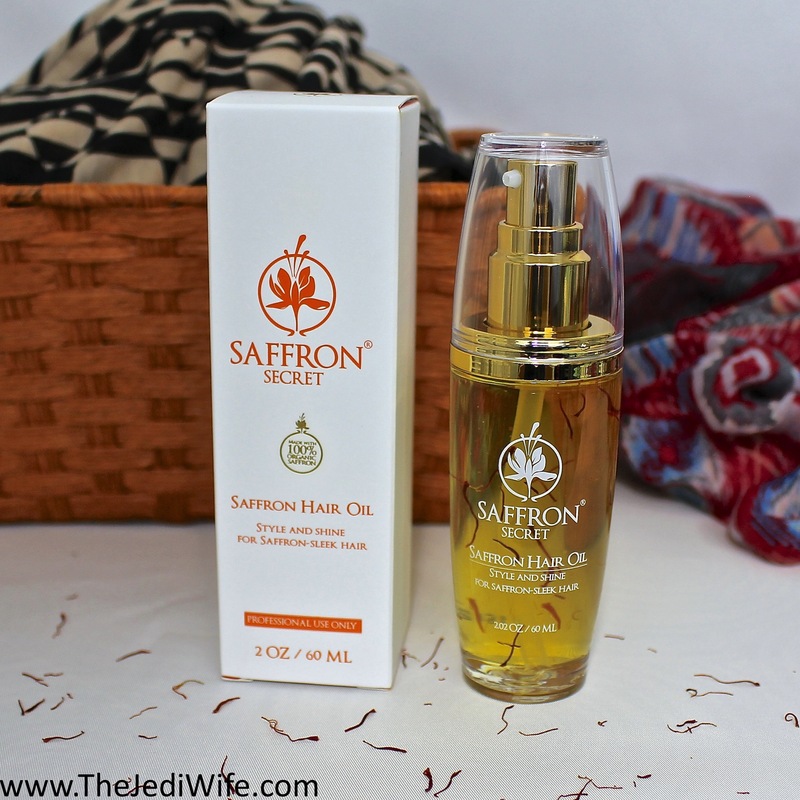 I had mentioned Saffron Secret as one of my beauty finds in a previous post, and I am happy to bring the brand back on my blog in its own independent post. I was provided with the Saffron Hair Oil in the original "Style and Shine" formula and have been testing it out for the past six weeks on my hair. This hair oil is loaded with organic saffron to nourish your hair with concentration Vitamin B2, a key activator of Vitamin B6 and niacin. These B complex vitamins are essential to support a healthy scalp and hair growth. It is a lightweight product that functions as a leave-in conditioner, styling cream, serum and shine spray, all in one fabulous product. With a single pump, you end up with the needed pea-sized amount to massage into your hair ends and up to the mid-length of your hair. I then follow up with a quick brushing to distribute a fraction of the product all the way down to my scalp. 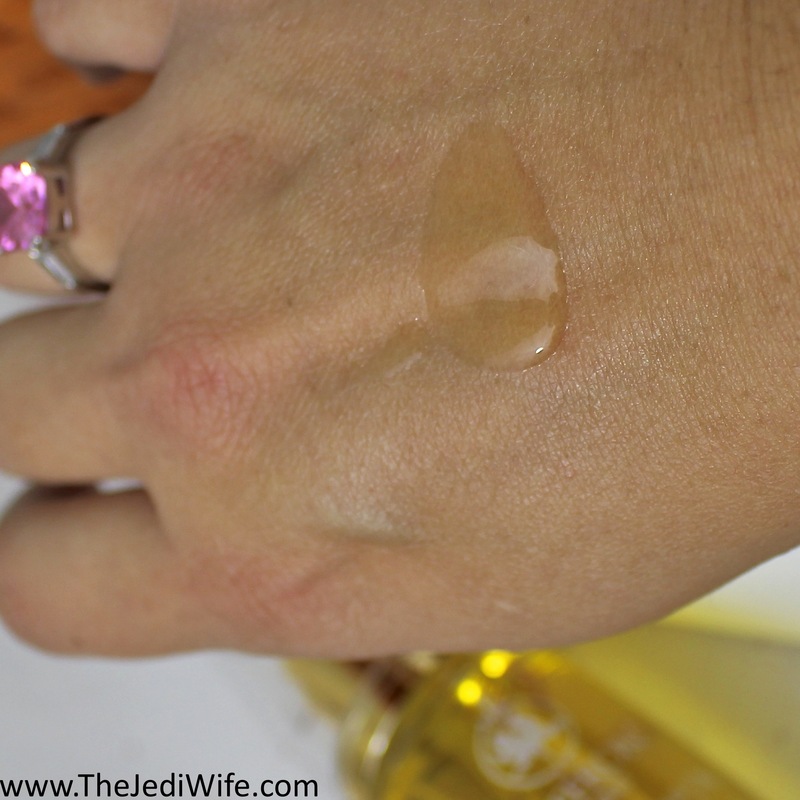 This photo is actually two pumps and more than is necessary to treat your hair, but it showcases the beautiful viscous formula of this hair oil. The Saffron Hair Oil does have a rather strong woodsy scent, so if you are sensitive to smells, you may want to proceed with caution when it comes to using this particular product. After six weeks of use, I am really happy with the quality of this product. I generally wash my hair every other day, and it adds a nice touch of moisture after my wash on day one, helping to keep my bit of frizz under control for a smooth and shiny finish. Even with using this hair oil on day one, I didn't find my hair too heavy and needing a wash on day two. As far as the scent, even though it is strong, I didn't have any issues with is bothering my sensitive nose. Although I could detect it myself, my husband swears he couldn't really notice the scent, even when he would sniff my hair. I suppose after asking him to smell my hair every few days, I should take him at his word! Now that my hair has enjoyed testing out a product utilizing the king of spice, I don't know if I could ever go back! The Saffron Secret Saffron Hair Oil is available for purchase from Amazon. Each bottle is 2oz, and it is currently priced at $59.95. While this does seem like a hefty price tag, Saffron is an expensive spice in general, and I have found that a little truly does go a long way in my hair. 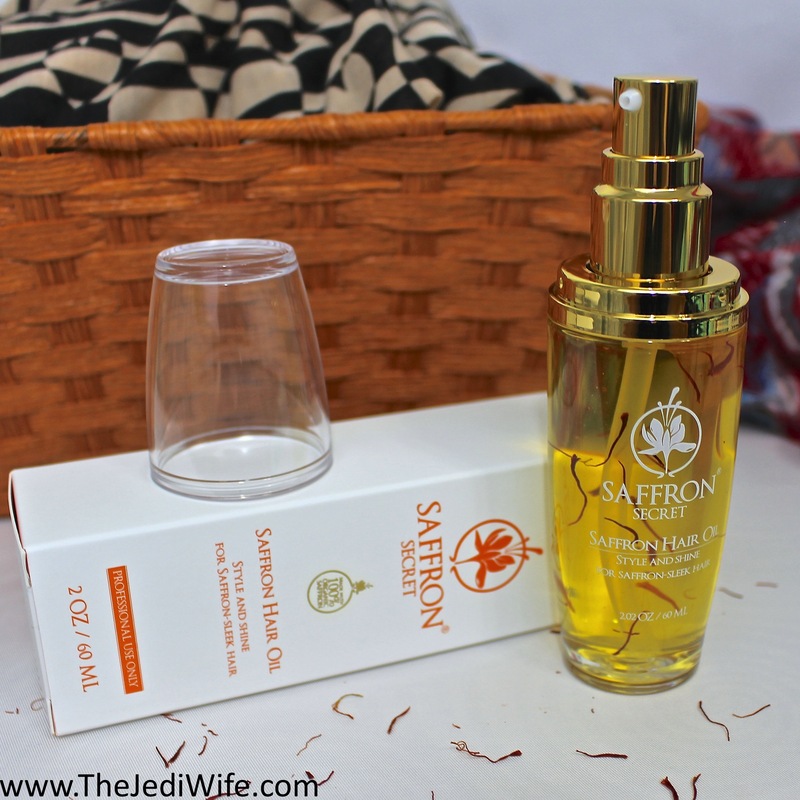 Have you tried any of the hair care products from Saffron Secret? If so, what was your favorite? Do you like to use oils in your hair? I'd love to hear from you! I didn't know that saffron was so expensive until just recently! I'm not sure if I can deal with hair oil in my thin hair but I'm becoming more brave on trying things! What an interesting product. The moment you said saffron I knew it was going to be a premium product. I always feel like hair oils will make my hair oily. Do you think this will be good for all hair types? Ohh this sounds really interesting, I am trying to look after my hair more as I've neglected it and hair oils used to be great for the ends. I've never tried this before. I should and see if it helps my hair out. Sometimes it can get so frizzy. The fragrance isn't for me but I like the sound of this anyway. I have never heard of Saffron oil but I want to give it a try. I like that it has B vitamins too. I love hair oils, they help tame my frizz and makes my hair shiny and soft. <3 Great review, I will look into it! I can't wait to try this out for myself! It looks amazing! I've never heard of this hair product before. Does it have natural ingredients? Oh wow never heard of this brand or even saffron oil. I personally love hair oils, they're absolutely amazing magical workers with my hair. Will be checking this out. I totally have no idea about saffron! I love holistic beauty and this is definitely something I would try. I have heard about Saffron before and this hair oil sounds great. I would love to try it sometimes and thanks for sharing. I haven't heard of this brand/product. But I tend to stay away from hair oils because I have really thin hair that gets oily looking if I don't wash every day. This intrigues me. That price tag kills me though. It sounds a bit pricey, but saffron in general is not a cheap spice to begin with, Lovely oil! My ends get so dry and I constantly tell myself to use oil but I haven't yet. I wonder what saffron oil would smell like though. I love taking care of my hairs and for that I keep finding good nourishment oils that suits my hairs. Currently I'm using the coconut oil by Body Shop, but will for sure love to try saffron oil. A bit pricey but works wonders!